Continuous rim for chip-free cutting. Can be used on right-angle grinders and hand saws as well as tile saws for both wet and dry cutting. 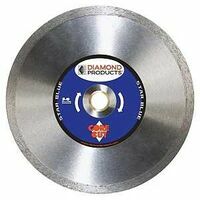 Dry cutting general purpose blade with .090" thick edge for use with portable tools, circular saws and worm drive saws. Designed for fast shallow cutting in brick, block and tile. Matrix design minimizes chipping. Steel body delivers constant depth of cut.